The triturator that was used to produce smallpox and rabies vaccines was donated by the Hong Kong Government Department of Health in 1995. This decommissioned device witnessed an important moment in the history of disease prevention in Hong Kong. According to the World Health Organization, there have been no smallpox cases in Hong Kong since 1952. Hong Kong was further certified disease free in 1979, 2 years before the worldwide eradication. Despite this, the story that the machine tells is an unfinished one, owing to perpetual speculation about whether Hong Kong would have been able to prevent contagious diseases on its own. The triturator, measuring 32 cm tall and 21.5 cm in diameter, was produced in Lausanne, Switzerland. It was used in the processing of Semple-type vaccines, such as for smallpox and rabies vaccine between 1940 and 1982. Usually, lymph pulp of calves was fed into the machine with glycerine through the conical copper funnel on the top. The tissue then passed through the central copper grinding spindle before the emulsion was collected via a key in two lower crescent-shaped stainless steel cups. 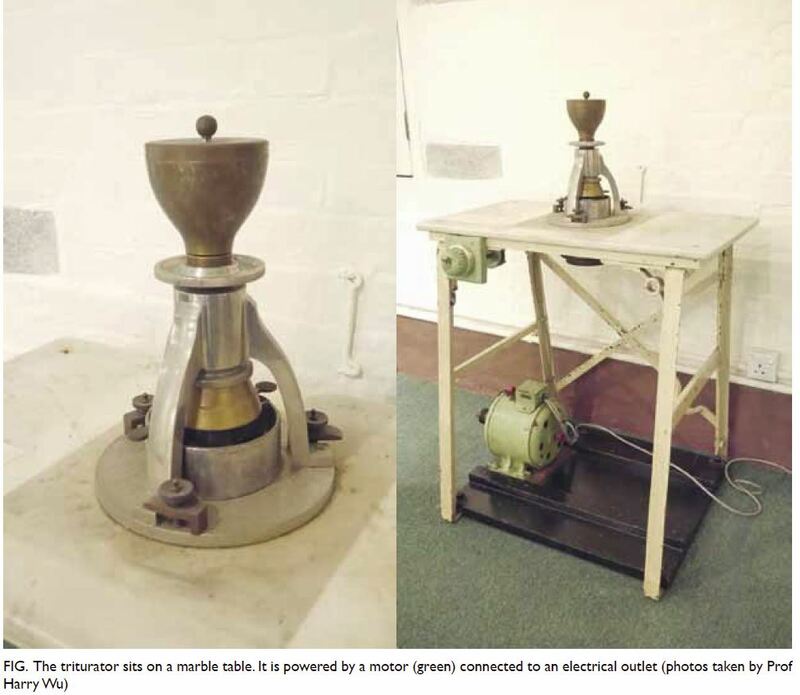 The grinder was powered by an electric motor under the marble table (Fig). To prevent contamination, the equipment was protected with a wood-framed glass hood. In general, calves were the most commonly used animals for producing smallpox vaccine. In Hong Kong, buffalo calves were originally kept in the Animal House of the Bacteriological Institute, before the house was demolished to become Caine Lane Garden. In Hong Kong’s medical history, credentials are given to a number of individuals regarding the development of smallpox vaccination technology, for example, Alexander Pearson, a surgeon working for the East India Company in the early 19th century, who practised vaccination in Macao; Pearson’s student, Yao Hochun, known as A-Hequa by Westerners, who published a book on vaccination in 1817; and William James Woodman, Medical Officer of Health, who scaled up the vaccination campaigns among Chinese through Tung Wah Hospital and the Chinese Public Dispensaries in 1916.1 Smallpox vaccination could not have been successful without these important figures. However, history tells us how disease onset, development, and control were contingent upon factors beyond the individual sagas of these heroes. Between 1858 and 1952—the respective dates of the first and the last reports of smallpox cases in Hong Kong—vaccination was just one of many measures taken to deal with the endemics resulting from a variety of social conditions. The effective control and exacerbation of infectious diseases were both attributed to Hong Kong’s unique geographic environment. For example, as a peninsula connecting Canton, commercial travelling was common between the inland and the port, accelerating the spread of diseases. As an archipelago, smallpox patients had, for a long period of time, been isolated in the jail on Stonecutters Island. And as a growing financial and transport hub, Hong Kong had to digest innumerable travellers en route from rural southern China to Southeast Asia, or across the Pacific to the United States, at the risk of becoming a ‘redistributive depot’ of diseases.5 In 1938, Tung Wah Smallpox Hospital, which was established in 1908 in Kennedy Town, was no longer able to accommodate the surging numbers of smallpox victims caused by refugees fleeing the Sino-Japanese War. The shutdown of connections between Hong Kong and the important surrounding ports in the Straits Settlements,6 Amoy,7 and Formosa,8 became one of the inevitable measures for preventing a foreseeable pandemic. The rise, fall, and eventual disappearance of smallpox and other contagious diseases in Hong Kong attest to the complexity of disease prevention. Owing to the drastic decline in smallpox cases in Hong Kong, the Pathological Institute (the original Bacteriological Institute) ceased smallpox vaccine production in 1973.11 However, using the smallpox vaccine as an example, we can see how a simple technological object functioned and how its nature manifested in a complex society. In 1923, the Vaccination Ordinance required that ‘any person, who in his opinion [of the Medical Officer of Health] has been subjected to the risk of infection from smallpox, should be vaccinated or re-vaccinated’.12 Now, the vaccination policy has become one that emphasises the citizen’s own health insights and risk-bearing capacity. From an antipathic society to a hub receiving Chinese medical tourists for various types of vaccination, Hong Kong is now facing other problems that accompany novel types of immigration, a more complicated cultural and societal composition, and growing tension between necessary population flow and the protection of its own citizens. 1. Chan-Yeung MM. A Medical History of Hong Kong: 1842-1941. Hong Kong: Chinese University of Hong Kong Press; 2017. 2. Hsiung PJ. Ill or Well: Diseases and Health of Young Children in Late Imperial China. Taipei: Lien-ching; 1999. 3. Hunter W. Report of the Government Bacteriologist, for the year 1902. Hong Kong: Government Public Mortuary; 1903. 4. New Cases of Smallpox Vaccine Flow Here by Daedalus. The Hong Kong Telegraph. 2 Feb 1938. 6. Hong Kong declared an infected port by the Government of Straits Settlements. Hong Kong Government Gazette 1939 (Supplement), No 7, 6 Jan 1939. 7. Hong Kong declared an infected port by Amoy. Hong Kong Government Gazette 1938 (Supplement), No 31, 4 Feb 1938. 8. Hong Kong declared an infected port by the Government of Formosa. Hong Kong Government Gazette 1938 (Supplement), No 48, 18 Feb 1938. 9. 4,000,000 Smallpox Vaccine Doses. Hong Kong Sunday Herald. 18 Dec 1938. 10. Wong S. The calf vaccinating table. Hong Kong Med J 2017;23:101-3. 11. The Bacteriological Institute and its contributions to Hong Kong. In: Hong Kong Museum of Medical Sciences Society. Plague, SARS and the Story of Medicine in Hong Kong. Hong Kong: Hong Kong University Press; 2006:147-224. 12. Legislative Council, Draft Bill: An Ordinance to consolidate and amend the law relating to Vaccination. Hong Kong Government Gazette; 1922:176.